SWOC is producing another in the Vivace series of oratorio concerts in May 2018. 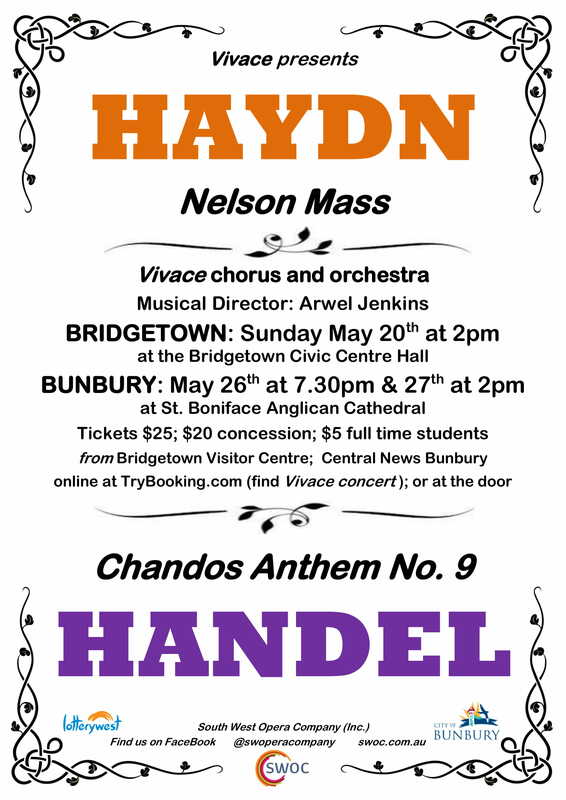 The programme comprises Haydn’s Missa in Angustiis, or Nelson Mass, and Handel’s Chandos Anthem No. 9; both beautiful choral works. For this concert Marguerite Monagle hands over musical direction to Arwel Jenkins, and turns instead to singing, as soloist in the Nelson Mass. The other soloists in the Haydn mass are Gabrielle Chadwick (alto), Robert Littlewood (tenor) and Tony Martin (bass). These three are joined by soprano Elspeth Binckes in the Chandos Anthem. The chorus of 55 has been thoroughly drilled by Arwel, as has the Vivace orchestra, comprising strings, woodwind, trumpets, tympani and organ. The resulting sound will raise the roofs of the Bridgetown Civic Centre Hall on Sunday May 20th at 2pm, and St. Boniface Anglican Cathedral in Bunbury the following weekend: Saturday 26th May at 7:30 pm and Sunday 27th May at 2 pm. Those who have attended previous Vivace concerts (since 2001) will be keen to attend this one, as will be all supporters of high quality classical music in the region.